This recipe was created for the sole purpose of using my brand new immersion blender. I had a very domestic birthday. I received a sewing machine (note: I totally sewed that place mat you see there. The hems are ALMOST straight. Pretty much a professional.) a three piece cupcake carrier, an immersion blender, tart pans, ramekins and a collection of amazing cooking and food styling books. (Oh, and a hangover. We will get to that in another post. Coming to you soon.) Serious jackpot. I had never used an immersion blender before, but knew it was something that I wanted to try. Who likes to puree their soups two cups at a time in a semi functional blender? Not this girl. I’ve scalded myself multiple times. I have hot soup battle scars. I can be kind of a hot mess. My parents always said, “there’s a reason we didn’t name you Grace.” I would like to say that comment is rude, but it is just ever so true. Darn it. The result of this need for culinary adventure was a beautifully easy and creamy soup! It was so delicious, in fact, that one of the sneaky creatures I live with tried to get in on the action. So sneaky. That girl loves squash more than anything ever. More than peanut butter or hot dogs…or peanut butter and hot dogs combined. Yes, I’ve mixed them together. We like to get creative. 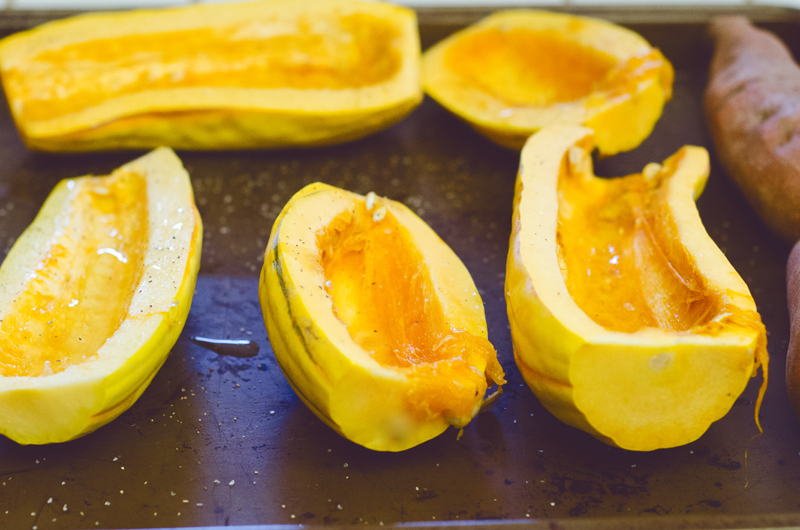 Wash, cut and de-seed your delicata squash. Wash your sweet potatoes and cut off the ends. Make an X on the top of your sweet potatoes with a knife. Cover a baking sheet with tin foil for easy clean-up (I didn’t do this. Whoops.). Place your delicata squash and sweet potatoes on the same baking sheet. You will have your squash flesh side up. Add some olive oil to your squash and salt and pepper it to your liking. Bake your squash and sweet potatoes for 40-45 minutes. They should both be tender. The sweet potatoes should separate easily from their skins. While your squash and potatoes are cooling, get out your soup pot and heat up enough olive oil to lightly coat the bottom of the pot. Add in your diced-up onion and garlic. Saute until the onion becomes translucent. Add in your spices and cook together with your onions for a couple of minutes until it becomes really fragrant. Add in your broth and your coconut milk. 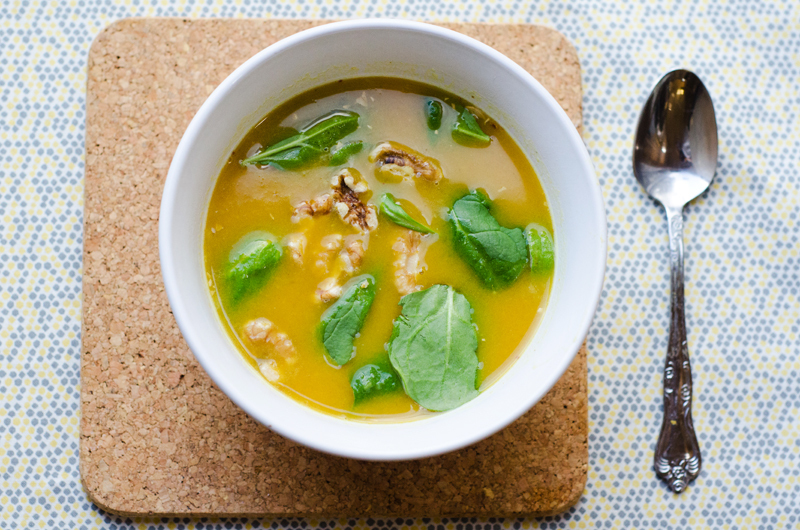 At this time, you can start to scoop the flesh from your delicata squash into your soup. Once all of the squash is added, remove the skins from your sweet potatoes and add the orange meat to the soup as well. Let your soup come to a boil. Once it has boiled, turn your heat down and allow it to simmer for 25-30 minutes stirring occasionally. When your soup has simmered…. It’s immersion time. Blend with your immersion blender until your soup is a creamy texture. That’s all. 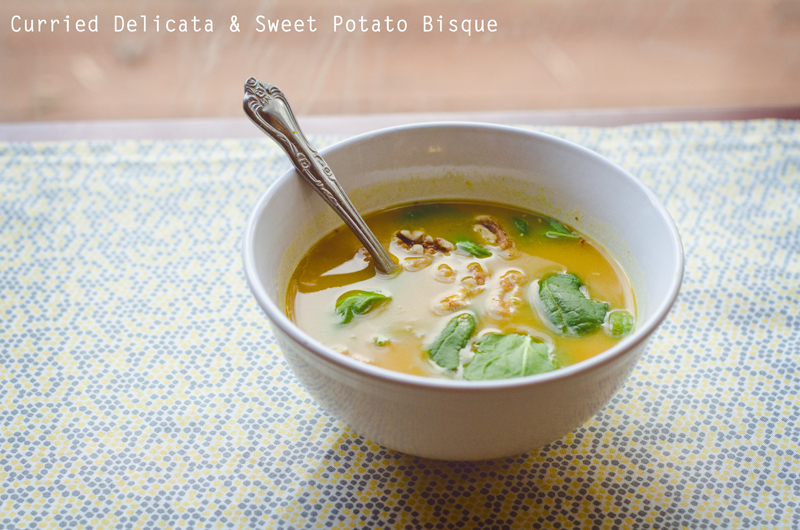 A nice simple and warming bisque for a chilly season. I garnished mine with toasted walnuts and a little bit of spinach. 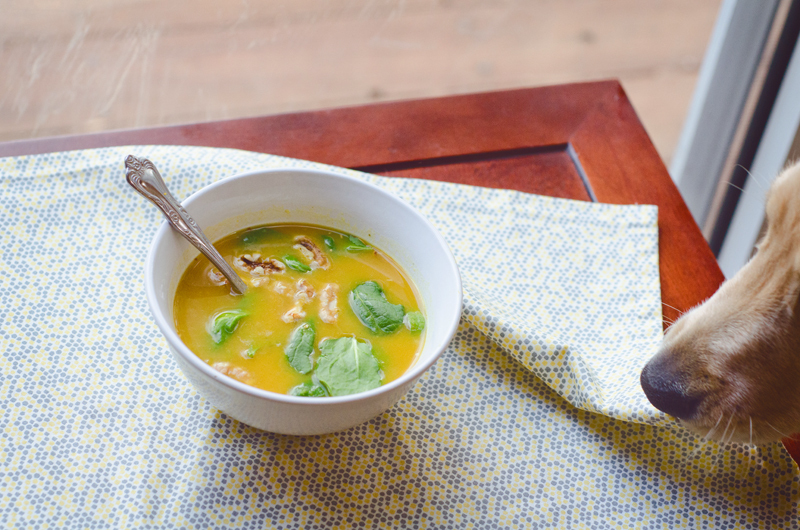 It’s the perfect soup to share with a friend on a brisk fall day! Even if they are covered in golden fur. 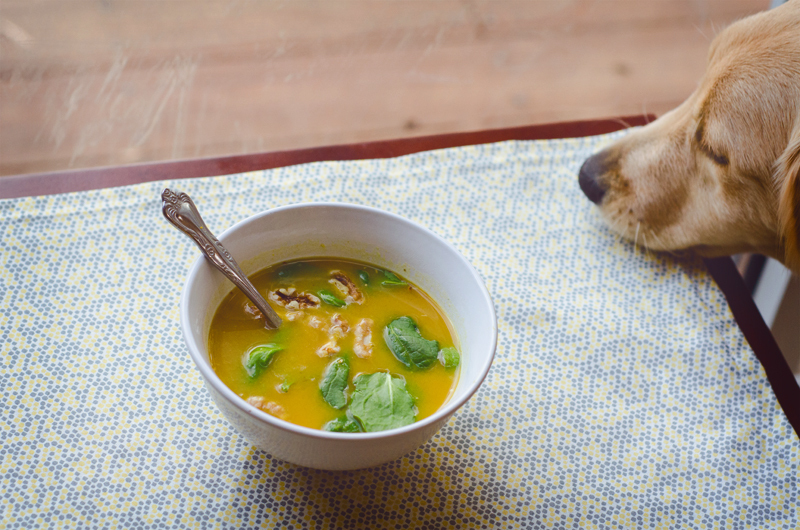 Sneaky soup thief. So cute! I love your dog! I can’t stop liking all the pics you put up on facebook! Check out my blog sometime… I update it occasionally. This looks amazingly delicious! I can’t wait to make it for dinner tonight! Thank you for sharing. My whole family loved this soup! My son actually gave it the #2 spot of his favorite soups that I make (and I make a lot of soup) 🙂 Thank you! This soup is awesome! Bought my delicato squash from Trader Joes and while I was there I bought 2 quarts of broth and the lite coconut milk. Roasted the veggies on Saturday and made the soup Monday. Very important to use all the spices as it really develops a zippy deep flavor profile. It is also low in fat because the coconut milk only adds about a gram of fat per serving! But it tastes like you are eating full cream!